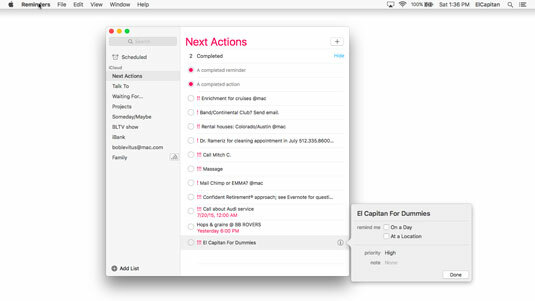 Reminders in OS X El Capitan will be familiar to anyone with an iDevice because it bears more than a passing resemblance to the iOS Reminders app. Reminders help you stay organized. Unlike an event, a Reminder item isn’t necessarily associated with a particular day or time (although it can be). Furthermore, reminders can be location-based, which is handier on an iDevice than a Mac, but a great feature if you have such a device. Finally, Reminders can have a priority level of Low, Medium, High, or None. If you have an iDevice and sync with iCloud, or Microsoft Exchange or Office 365, your Reminders will appear on all your Apple devices — other Macs, iPhones, iPads, and iPod touches — simultaneously, which means you should never miss a reminder. 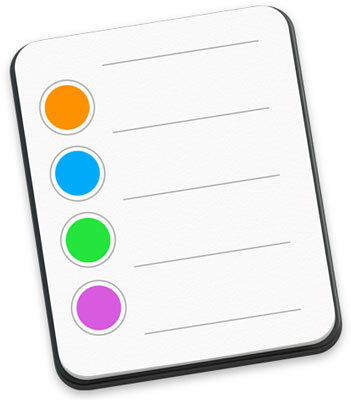 Just set a reminder on your Mac or any iDevice, and you’ll never forget anything. Before you create or manage your own reminders, there are a couple of things you should know, starting with the concept of lists. Reminders includes a list called Reminders by default. You can delete or rename it if you like, and you can create additional lists if you care to by choosing File→New List, pressing Command+L, or clicking the plus button at the bottom of the window. If you have a bunch of lists with names like Next Actions; Talk To; Projects; Someday Maybe; and so on, Reminders creates a section for completed items at the top of the list when you click the circle before each reminder’s name to indicate a task is done, like a completed action and a completed reminder in this figure. Nine lists (left) and all the reminders on the Next Actions list (right). In other words, when you check the box for an item, the item is moved from whichever list it’s on to the Completed List. To rename a list: Right- or Control-click the list, choose Rename from the contextual menu, type the new name, and press Return when you’re done. Or select the list, press Return, type the new name, and then press Return again when you’re done. To display a list in a separate window: Double-click the list name; right- or Control-click the list, and choose Open List in New Window from the contextual menu; choose Window→Open in New Window; or press Command+Return. To show or hide the little calendar: Choose View→Show/Hide Calendar or press Command+Option+K. To show or hide the List Sidebar: Choose View→Show/Hide Sidebar or press Command+Option+S. You don’t have to have more than one list. You don’t even have to change the default list name (Reminders). That being said, organize Reminders into separate To-Do Lists. The point is that you can make a bunch of lists or dump everything into a single list; just use lists to organize your reminders so they make sense to you. The preceding sections tell you pretty much everything about Reminders except how to create one, so it’s time to find out how to create a reminder. It couldn’t be easier: Just choose File→New Reminder; press Command+N; click the Plus button in the top-right corner of the Reminders window; or click the first blank line in any list and begin typing. Remind you at a specific time on a specific date. Repeatedly remind you at a specified interval. Remind you at a specific location (great for iPhone and cellular iPad owners). And reminders can also have a priority and notes. To access these features, you need to Show Info for the reminder by choosing VieShow Info; pressing Command+I; clicking the little i that appears on the right side of the reminder (hover your cursor over the right side of the reminder if you don’t see it); or double-click a blank spot on the reminder. Show Info for a Get Ice Cream reminder is shown here. 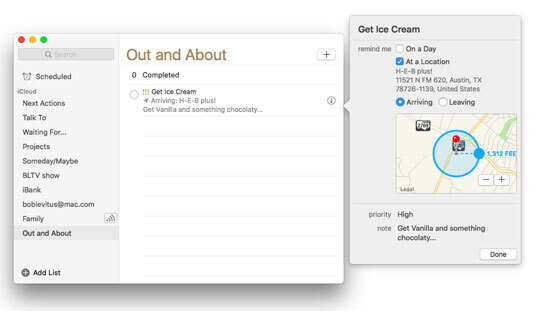 The first time you try to use At a Location, your Mac will present a dialog asking whether you want to Enable Location Services to Allow “Reminders” to Use Your Current Location. If you agree, you’re done. If you disagree and don’t want to enable Location Services for the Reminder app, just click the Cancel button. Finally, if you wish to enable Location Services at a later date, open the Security & Privacy System Preferences pane and click the Privacy tab. Click the lock and provide your password if necessary, then click Location Services in the list on the left, make sure the Enable Location Services check box is enabled, and then enable the check box for Reminders. Close the System Preferences app and you’re done. If you have an iPhone, location-based reminders are awesome. Give them a try. Finally, to reorder reminders in a list, click a blank spot on any reminder, drag it up or down, and drop it into its new position.